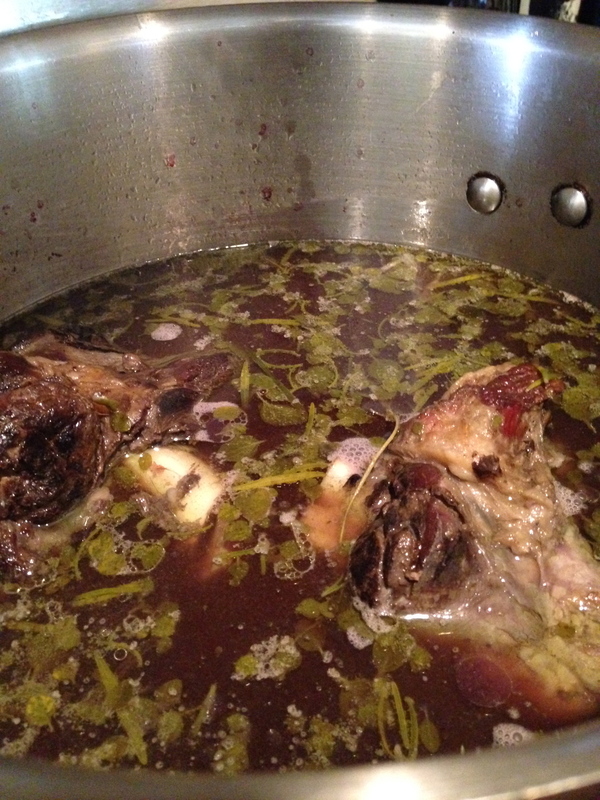 Aaron Needs A Goat–I Have A Stew To Cook, Sins To Confess, And Côtes du Rhône To Drink. 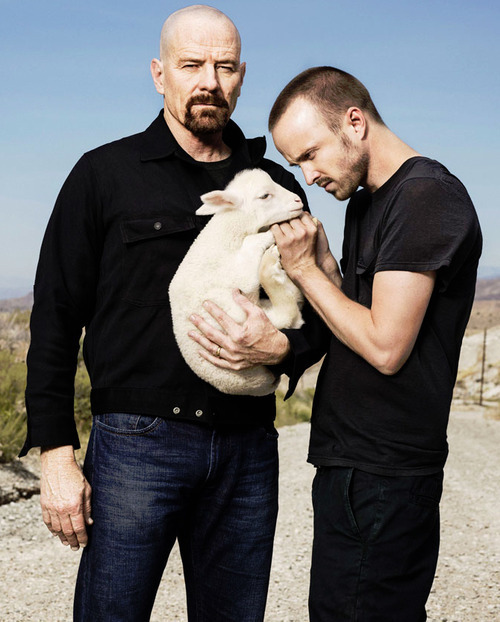 Let’s Here It For Family Bovidae!! Often this creating of harmony requires a sacrifice, and that sacrifice signifies a purging, a purification that allows the community to become whole again. Purification. Purging. Yom Kippur, the Day of Atonement. A ritual to cleanse the sanctuary and purge the people’s sins. And for that, you need a goat. 16.15 He shall then slaughter the people’s goat of sin offering, bring its blood behind the curtain, and do with its blood as he has done with the blood of the bull: he shall sprinkle it over the cover and in front of the cover. Marc Zvi Brettler in How To Read The Bible offers insights into ancient Hebrew scripture through modern archaeological discoveries and current scholarship. A great read, and very helpful in my thinking about Leviticus, a sacred text which offers a complex world of nuanced rituals. Impurities accumulate on and in the temple and must be removed. Slaughtering produces blood, the sprinkling of blood seven times purges the shrine of uncleanness and transgression. And the other goat? The scapegoat? The words of sin spoken to the living goat who then scampers off into the wilderness. Sins transferred then disappear. At the Harvey/Maya household our meals certainly sanctify our home, and food on the table allows for conversation which often can include sharing troubles, offering consolation. 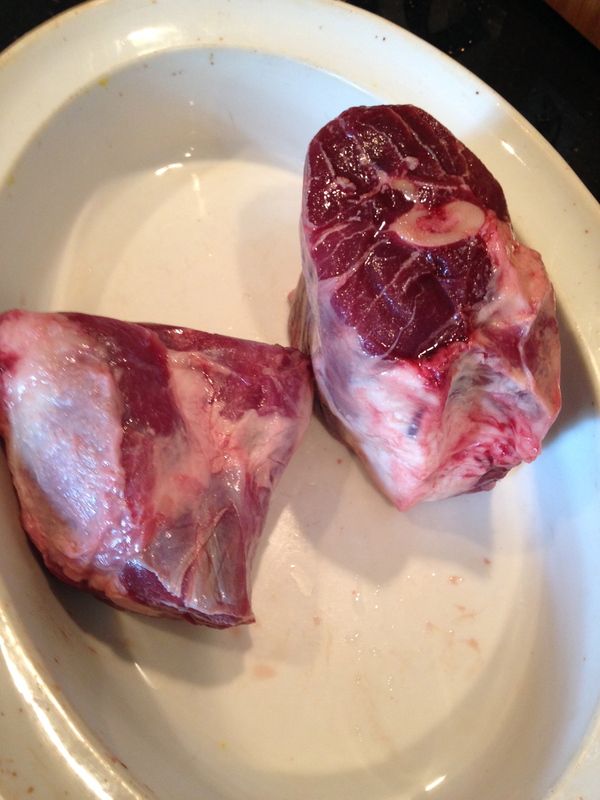 So, I ordered two goat shanks through Greenling from Windy Hill Farm. Look again, look closer. Look at the deep red-colored flesh, the blood. Look at the wondrous marbling, the rivers and creeks of fat. Confess your sins. And then take a virtual trip to Comanche, Texas. 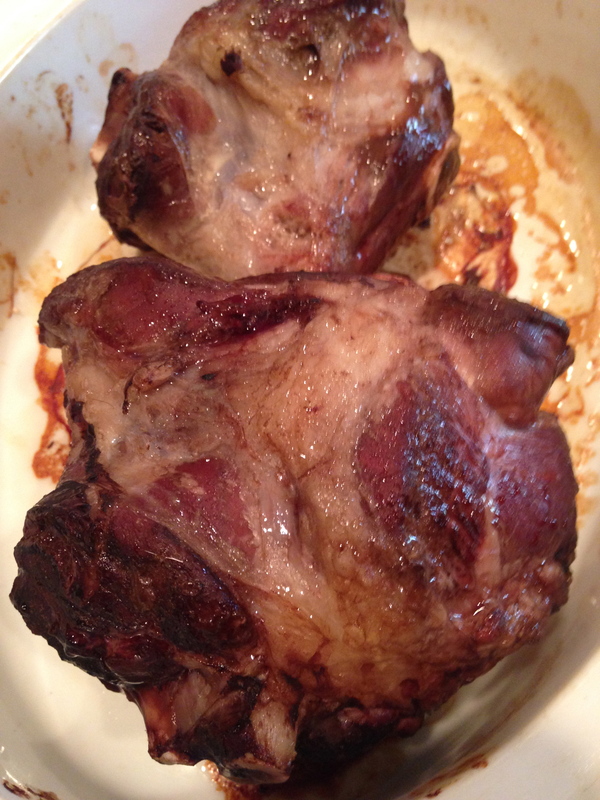 The goat shanks have been in the oven at three hundred and fifty degrees for a half-hour and should be ready. Ah yes, look at them. I gently place them in water with bay leaves, crushed garlic and fresh oregano leaves and stems. I have some time, what does the revered 1961 Larousee Gastronomique have to say about goat? Swiss dried air-meat fashioned in the Swiss Alps during winter. 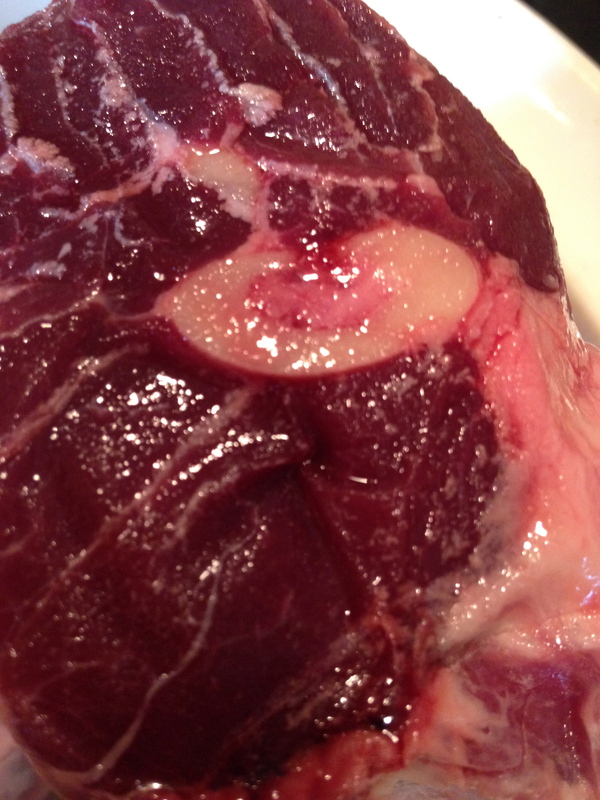 Cold, not positive, especially the blunt note on eating goat–but for reasons which have nothing to do with gastronomy. Ouch. What about Magnus Nilsson at Fäviken? No one eats goat in Sweden, but they do dine on kangaroo. Okay, that’s a sign of the apocalypse. Will no one speak up for the goat? Check out this link. I’m sure Andrew Zimmerman will help me out. And so will Chef Pasquale. Ah, now that’s a goat head. So, back to my goat stew. 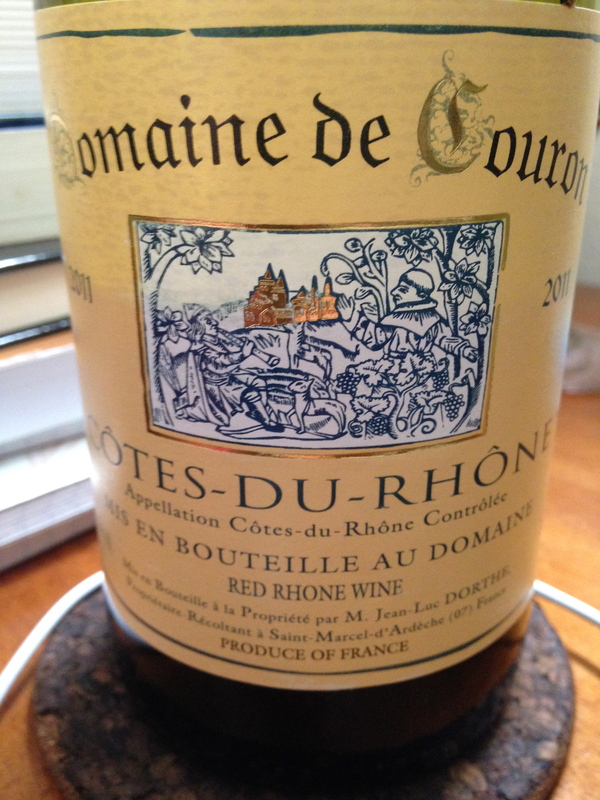 I’ve purchased a Domaine de Couron Côtes du Rhône 2011 and Terres d’Avignon Cotes du Rhone 2011. I’ve gone to the region around Avingon out of respect for southern France and it’s love of the goat, and out of my respect for the troubadours. Also, the berry, black pepper, coffee and chocolate fullness of these wines will work well with my goat, so I’ve poured half of the Domaine de Couron into the pot, saving the rest for the cook and the gods, of course. Considering this is priced under fifteen dollars, once you let oxygen start doing it’s magic, the Domaine de Couron gives and gives. 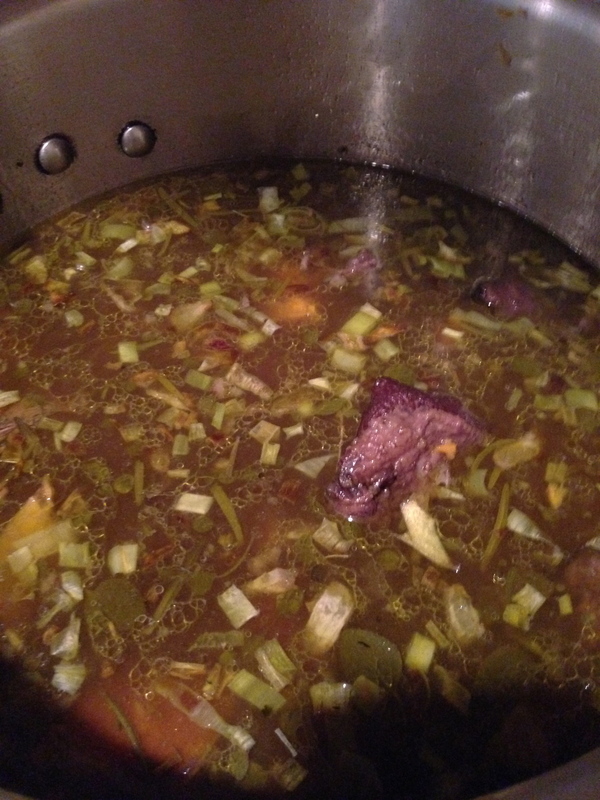 Which means my goat stew now looks like this. You might wonder, what music accompanies the slow-cooking of goat? Easy answer my friend, Gogol Bordello. 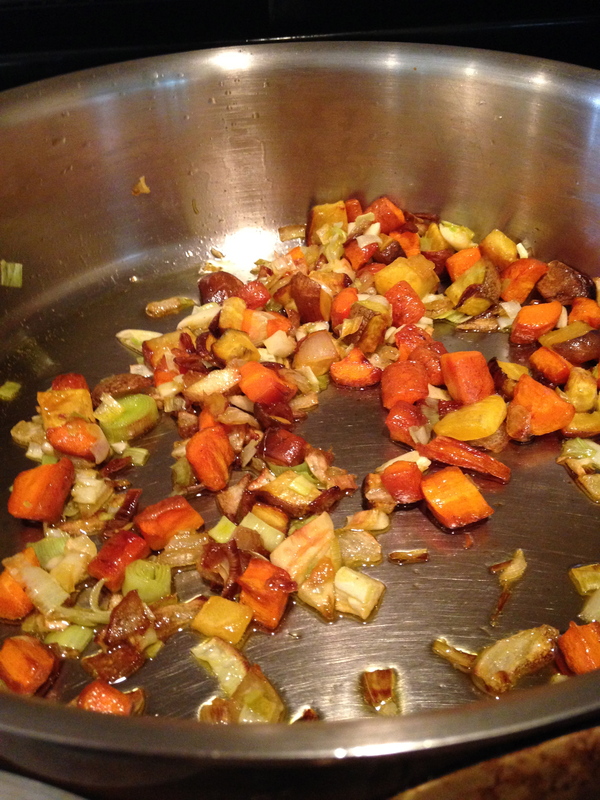 While you were dancing, I braised onion, carrots, yellow beets, leeks and garlic in olive oil. Now I’m parboiling a large sweet potato I’ve halved, quartered, then cut again. I’ll then put that in the pan with the vegetables and sauté. 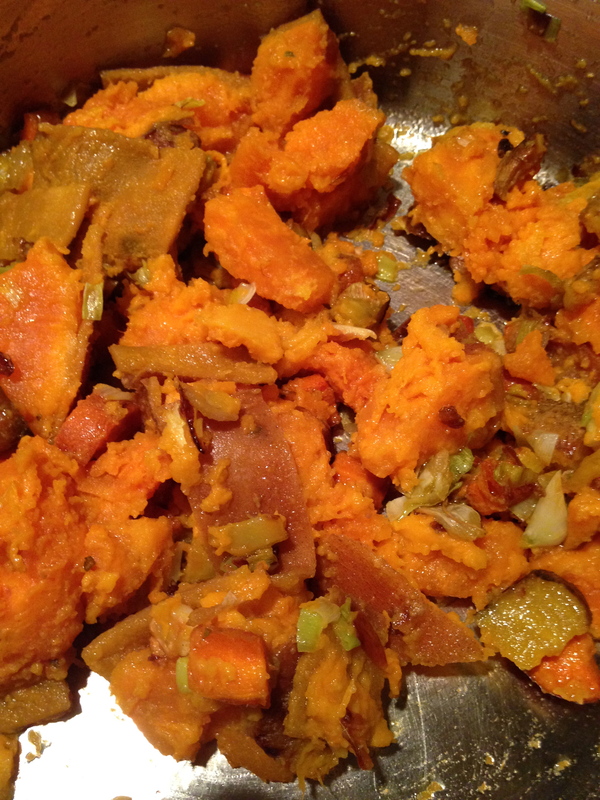 The parboiled sweet potatoes have been tossed with the caramelized veg and we’re ready to add the goat broth. And then, the goat stew is ladled into bowls and served to the family. 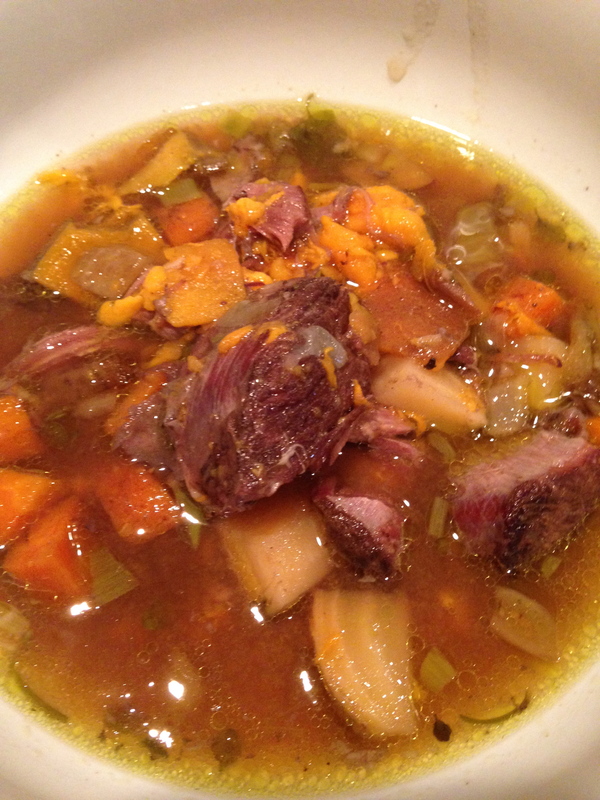 The goat bones add a protein-rich, thick kick to the stew, and the goat meat adds a darker taste than lamb; however, with the sweet potato rounding out those harsh edges with, well, sweetness, a balance, a harmony of the cosmos seizes the day. All and all, a successful meal with Gabriela and Demian giving me the thumbs up. And so ends . . . wait a minute, Gabriela has prepared a desert! Look at this! 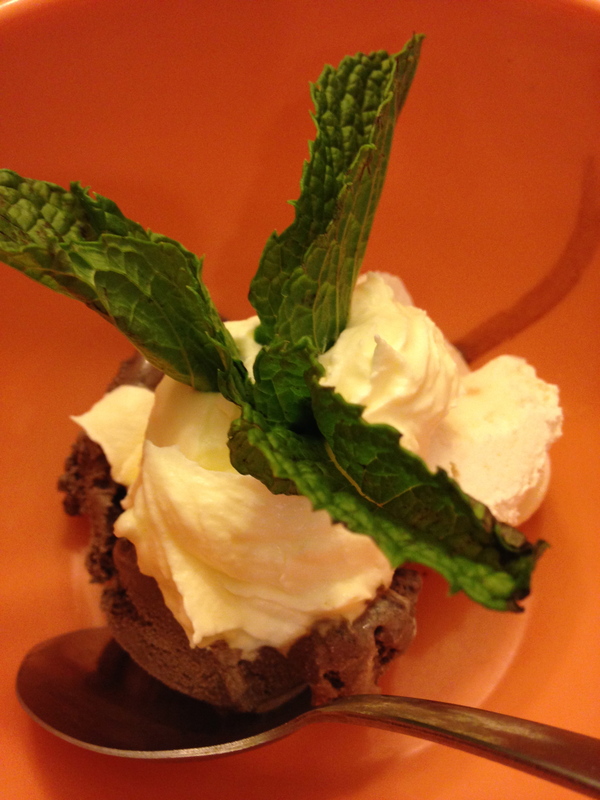 Three Twins Ice Cream Brownie Batter Chunk and Lemon Ice Cream meets Gabriela’s homemade whipped cream topped with springs of mint. Score! We read a few more final pages of The Fellowship of the Ring, Boromir has just tried to grab the ring, and it’s time for bed. Well, Gabriela and Demian climb the stairs, I turn to the back patio and contemplate the day with a glass of Côtes du Rhône and an Alec Bradley cigar. Goodnight Moon. Previous Previous post: Terroir Battle? You Know What Side I’m On!